People often ask me what music I play in my classes so here is my playlist from the Be Happy workshop I ran last weekend. 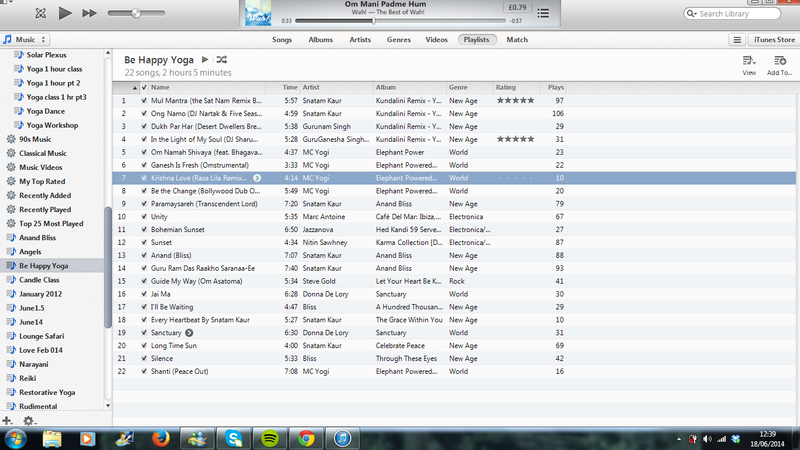 It was an uplifting theme so the tunes are good for a vinyasa flow practice. This entry was posted in Yoga on June 18, 2014 by louise. My initial experience of the practice of karma yoga was when I stayed at the Sivananda Ashram in Kerala for the first time a few years ago. As part of living there you are required to spend an hour a day “working” around the centre, this was your karma yoga practice. 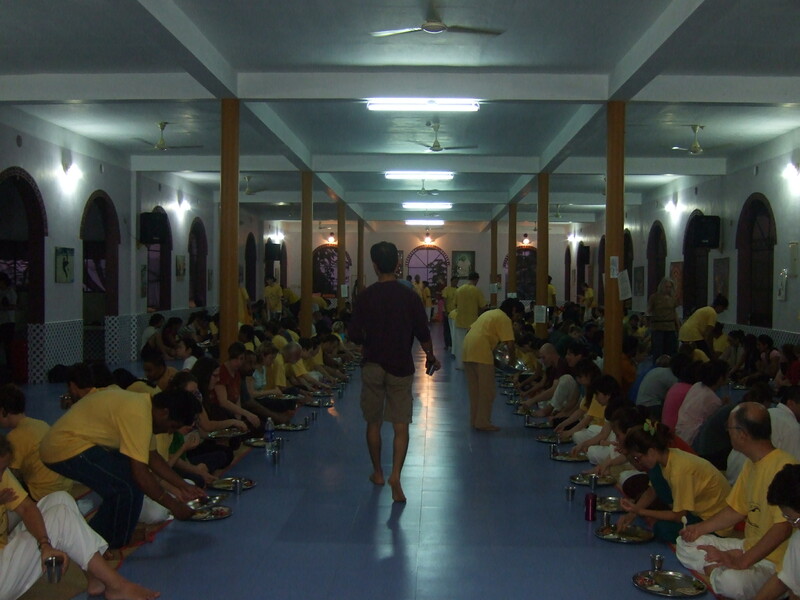 This being my first visit to an ashram one of my biggest worries was about coping with the lack of food, for me the idea of just having two meals a day and not being able to choose what they were concerned me. I liked to have the freedom to eat when I needed to! 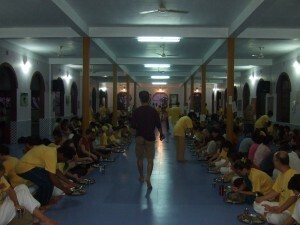 So ironically enough my “karma yoga job” was to serve the meals to everyone, I couldn’t eat until everyone else had! After being up since 5am, meditating and chanting for a couple of hours, then practising yoga asana for a couple more , you can imagine I (and everyone else) was pretty hungry by 10am. I then had to race up to the dining hall to grab buckets of food and pass down each aisle scooping out the breakfast/lunch on to everyone’s plates. It was a good practice for me to give up being so attached to food, and to put others before my own needs. When I went back the next year I actually asked for that to be my karma yoga! Karma yoga is selfless service. It’s doing something for others with no expectation of anything in return, for example payment or gratitude. Mother Teresa is a shining example of a karma yogi – she would call it “love in action”. It’s the same message as written in the Bible “love your neighbour as your self”. The Bhagavad Gita teaches it as a sacrifice to God, to put yourself aside and to work for works sake so that he can work through you. You might practice karma yoga through random acts of kindness through out the day/ week. You may choose to volunteer. You may choose to seek to do something good for your environment, the world, a cause that touches you. You may choose to pay attention to the words you use to others, to only speak kindly and positively. You may choose to send out love and positive thoughts to the world every day as part of your meditation practice. Yoga isn’t just about the physical practice of asana, the deeper you go into it you start to experience and learn that it’s actually a whole lifestyle. Karma yoga is one aspect of this and there are many lessons to be learned from doing it. Noticing your thoughts and reaction to serving others with out looking for any return from it is illuminating in itself! I have since incorporated karma yoga into my week by volunteering at a cats home and a drop in centre for homeless. There are times when I really don’t feel like going and when I feel like I don’t have the time but I never regret it after I have been. Even though the idea is not to get anything from it you can’t help by be affected by giving to others. This entry was posted in Yoga on June 3, 2014 by louise.